Veteran Leander Paes is out of contention but top singles player Yuki Bhambri will make a comeback to the Indian Davis Cup team along with Saketh Myneni when the AITA Selection Committee meets on Monday in Thrissur to announce squad for the World Group Play-off tie against Canada in September. 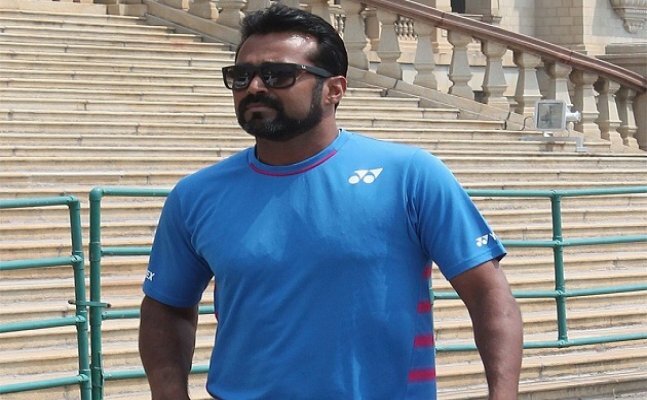 The 44-year-old Paes was included in the six-man squad for the previous tie against Uzbekistan in Bengaluru in April this year but was left out of the final four by the new captain Mahesh Bhupathi Upset and embarrassed, Paes had left the venue mid-way into the tie, prompting Bhupathi to reveal on Facebook that he had never promised Paes a spot in the final four and that his action was final nail in the coffin. The AITA does not want a repeat of any such unsavoury incident and also that Paes is now behind three Indian players - Rohan Bopanna (21), Divij Sharan (53) and Purav Raja (54) - in the rankings, the winner of the 18 Grand Slam titles is not to be considered by the Committee.Both Bhambri, who recently beat world number 22 Gael Monfils, and Saketh Myneni had missed the Uzbekistan tie due to their respective injuries. Now that they are back on the ATP Tour, they will take their places back in the side for the September 15-17 tie in Edmonton. Ramkumar Ramanatha who created a ripple by beating world number eight Dominic Thiem will be the other singles player in the team.Bopanna being the highest-ranked doubles player in the country is automatic choice for the doubles rubber.Prajnesh Gunneswaran and N Sriram Balaji, who made their Davis Cup debuts in Bengaluru are likely to be reserve members of the squad.All the squad members will assemble in New York for a camp at the University of Colombia, a week before the tie, to be played on indoor courts. All India Tennis Association (AITA) says Paes needs to improve his ranking to stake a claim in the Indian team. "We are following norms. There are players, who are ranked higher than Leander. How can you ignore someone like Bopanna who is ranked 21. And the captain has the prerogative to have a squad of his choice," AITA secretary Hironmoy Chatterjee said. However, the AITA official said the door was not yet shut on Paes. "No, all doors are open for him. But he has to improve his ranking. We go by the rankings," Chatterjee said. Paes needs one more win to claim the world record for most Davis Cup wins in doubles. He is tied on 42 wins with Italian legend Nicola Pietrangeli. The AITA selection committee, headed by SP Misra, will also select a team for the Asian Indoor and Martial Arts Games to be held in September in Ashgabat, Turkmenistan.